This past week I am most thankful for all the donors. First off, we had a wonderful celebration of Pilau thanks to Beth Keen! The children enjoyed the pilau and we even added a little extra food (a local favorite) bananas and meat! What was truly special about these bananas was that they were from our own banana trees planted outside of our hotel. It made the bananas taste extra sweet. The children will be talking about this feast until the next Pilau Day! Additionally I want to thank Anna Tarkov for her wonderful article about the children and my role here at the school. It was nice to talk about the children and I appreciated her very kind article. It is so inspiring to know that our project is always growing, the children are receiving more attention and most of all they continue to inspire generosity. I never tire of talking about how they changed my life and opened up my heart. I could not love them more and all of you who take so much interest in helping a small village in Africa. It started off as an extra special week with one of my best friends Matt Partain or “Dr. 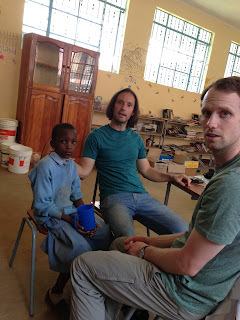 Matt” as the children affectionately refer to him, visiting our project. He has visited Tanzania so many times before, but every time is special. He continues to give and serve the children in every possible way. He makes time for them during his busy academic schedule by working for them during his Spring Break. Selfishly, I was just happy to spend time with one of my buddies, but his research on our children (focusing on their health and malnourishment) has helped secure a grant for extra Pilau Days and a more “bean-filled” makande. Not enough can be said about his commitment to the children. Along with the financial support of Barb and Ed Walters, I know our children are benefiting greatly from the improved diet. On to my favorite memory from the past week…on Tuesday we were playing outside at break time like every other day. I was playing catch with the children when a few ran up to me yelling “Mr. Terry, Regina needs you”. I went over to see her lying face down on the gravel, I lifted her up and saw blood coming from her mouth. I quickly took her to the bathroom, got her washed up and examined the damage. Luckily her beautiful face was fine, but she had chipped one of her two front teeth in half. I took her to see Dr. Matt and matron Agness. Agness explained that these sorts of things happen but most people just live with it, which is absolutely true. I have seen many chipped teeth on children as well as adults. Dental work is a luxury, but Regina is a fragile child, she is small, shy and doesn’t talk much to most people, which in turn makes me love her more. I want nothing more than to protect her and it was heartbreaking to see her hurt and insecure. She was reluctant to even open her mouth. Nothing is worse than having your smile stolen from you. So I asked Agness call her grandparents to ask them if I could take her to the hospital the next day. Initially this met with some objection from our administration “Schools don’t do things like that.” My response was simple “my school always will”. That of course ended the discussion. Knowing her family situation, I knew that the dental work would be too costly for her family. The next day Regina, Teddy, Innocent and I traveled to Kibosho Hospital to visit our friend Dr. Alan (insert every positive adjective to describe the dedication and love Innocent and Teddy, our hotel employees show our children). We left at 8:00 a.m. met with Dr. Alan and were directed to the waiting area. The African pace is well recognized to be slow, and in case you were wondering, African hospitals are also very slow. We sat together in the waiting area for about 5 hours before we were seen by the dentist. Truthfully this was probably the most enjoyable time and experience of all though. After I got her to giggle a few times and reveal her broken smile Regina finally relaxed and told me how she had never been in a car except a “dala dala” aka mini bus. Also she had never even been to Kibosho before, even though she said she thought her mother was from Kibosho. Before long the excitement wore her out and she fell asleep, in my lap, holding my hand. I sat motionless, her head on my leg, hand in hand and just knew “yup, this is where I should be”. After waiting for hours and hours, napping, talking and playing the dentist was ready. I held her hand as they put a brand new veneer on her chipped tooth. Even though the dentist was kind and welcoming, I have never had a little 45 pound girl hold my hand so tight. After they finished Regina looked in the mirror, opened her mouth wide to see all her teeth and stuck her tongue out feeling the new tooth. She gave a nervous giggle, thanked the dentist and then thanked me. I instinctively picked her up, gave her a hug, a kiss on the forehead and then thanked her too. I took her home so we could enjoy some nice beef and rice from the hotel with Mr. Matt. The next morning when I saw her she smiled, gave me a little hug and she continued on with her day. I will never forget the day we shared, but most of all I will never forget her smile. We never really know who we are until we become truly connected to someone and I think that is why I felt the need to thank her. Everyday I am blessed to feel connected to every child and pushed to want to be what they need. Giving a child a reason to smile again is exactly who I will always strive to be. I cannot thank you enough for your love and support. Also prayers and thanks are owed to the wonderful dentists and doctors at Kibosho Hospital for giving a beautiful child her smile back. 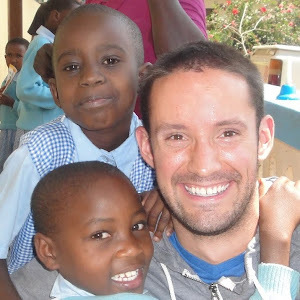 Follow Mr. Terry and the Watoto as he works with the Stella Maris school, which was built to serve the orphans and poorest of children in Mailisita, Tanzania. You can sponsor a child at our school for only $300. Please consider donating to sponsor one of our 74 unsponsored students. The Mailisita Foundation is an IRS designated 501(c)(3) charity. As such, all contributions are eligible for exemption from US federal taxes. My name is Terry Mulligan. I am a 25 year old elementary school teacher in Tanzania. Our school Stella Maris has been built to serve the orphans and poorest of children in Mailisita, Tanzania. Mr. Terry draws his inspiration from Mother Teresa: "We can do no great things, only small things with great love." Follow Adam's incredible journey as he teaches at Stella Maris!